The 2019 Toyota Tundra is not only one of the best performing, most popular pickup trucks available today, its exterior features make it a beefy road warrior with attitude. These exterior features combine to create a vehicle that is not only good looking but also powerful. A set of 18-inch forged aluminum BBS wheels comes as standard equipment on the Tundra, reducing unsprung mass by 3.35 lbs. per wheel and improving cornering ability and the overall quality of your ride. A 1/4-inch thick aluminum skid plate provides underside armor for the vehicle, sporting TRD lettering for good measure. Rigid Industries fog lights pack plenty of brightness when needed into a compact space. 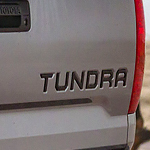 The exterior features of the Toyota Tundra may make it look intimidating, but it's actually a pussycat to control. We invite you to visit our Toyota Of Plano showroom to experience an exciting test drive for yourself.